An exceptional pair of gilt bronze and rock crystal wall sconces, four lights each. Magnificent and imposing pair of gilt bronze and rock crystal wall sconces, truly exceptional! Four lights each. 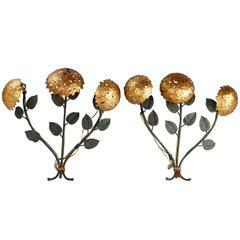 A fine and large pair of 19th century French Regency bronze, crystal and rock crystal three-light wall appliques or sconces.